Will Genia has been left out of the Stade Francais side to face Leicester Tigers in the European Rugby Champions Cup-opening fixture due to a knee injury. Genia joined the Paris club on Tuesday, 10 days after playing for Australia against New Zealand in the Rugby World Cup final, but he is yet to shrug off the effects of a knee injury he sustained in the World Cup semi-finals. "It's nothing serious," Stade coach Gonzalo Quesada said ahead of the fixture in England on Friday. "He will continue his recovery and he will be available to train with the squad from next week." 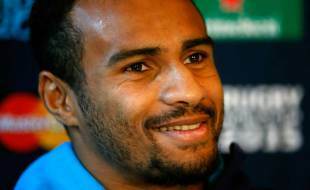 Genia could make his debut for Stade in the European Cup clash against Munster on November 22. "I am a competitor - I am not here for a vacation," Genia said. Leicester, the champions in 2001 and 2002, have lost just once in 28 home games in the competition, and they defeated the Paris giants at Welford Road in 2006 and 2007. "Friday night under the lights at Welford Road, the Champions Cup, Leicester Tigers v Stade Francais, these are the big fixtures that everyone wants to be involved in," Tigers director of rugby, Richard Cockerill told epcrugby.com. "It's going to be a big start for us. It's the first game of this season's tournament -- we kick the whole thing off -- which is kudos to us." Leicester go into the game on the back of a 19-6 loss to Exeter, their first defeat in the Aviva Premiership this season. French Top 14 champions Stade have never won the European Cup, finishing runners-up in 2001 and 2005. In 2001, they were edged 34-30 by Leicester in an epic clash in front of 75,000 people in Cardiff. "We can't wait for Friday's match even if we haven't had a lot of time to rest," Stade captain Sergio Parisse said in reference to Sunday's gruelling 14-9 win over Top 14 leaders Clermont.